Heesen has been on a roll this year with seven superyacht deliveries in the last 12 months, four of which are summer arrivals. The first of the four to be delivered this summer is the 55 metre Quinta Essentia, whose launch we reported on in March, and last in line is the 37 metre Aurelia, which splashed in June. Of the other two due for delivery imminently, Ariadna is the seventh yacht in Heesen’s award-winning 47-Metre class. What really makes her stand out from the crowd is her classical Moscow Ritz-Carlton-inspired interior, which Frank Laupman from Omega Architects was commissioned to design by her owner. Unusually, the owner's suite is on the upper deck aft, which has the advantage of extra privacy and magnificent panoramic views. Its opulent master bathroom has a freestanding classical bath with 24-carat gold-plated taps and Swarovski knobs. The similarly sized and adorned VIP cabin is located forward on the main deck, while the guest cabins, notable for their unique, classically-styled table and floor lamps, are positioned on the lower deck. Ariadna is a full displacement yacht, with a steel hull. She is powered by twin MTU 8V 4000 M70 engines which achieve a top speed of 15.5 knots, while giving her a range of 4,000 nautical miles at 12 knots. The other delivery is hull number YN 15850, the second vessel in the new 50 metre all-aluminium class of below 500GT. Frank Laupman of Omega Architects also did her interior design alongside the owner's own design company Star Design Ltd, and Italian furniture manufacturer Domusnova transformed the ideas into reality. Notable features include the electrically-powered, expandable dining table constructed from from glass that occupies the aft part of the main saloon, and the fireplace in the upper saloon. The hull is painted a distinctive grey, providing an elegant contrast against the white superstructure and stainless steel detailing. This semi-displacement yacht's naval architecture came from the boards of Heesen and Van Oossanen & Associates and she is fitted with a pair of MTU 16V 4000 M90 engines which top 23 knots. 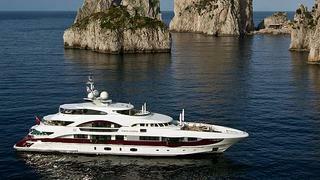 Heesen’s current order book now stretches into 2014, with 11 yachts from 40 metres to 65 metres in design or construction. The seventh delivery of 2011 will take place in late December when YN 15555, the first 55 metre displacement yacht, will join the Heesen fleet.